Christmas tipping not on your mind? According to a recent survey by mobile payment provider Square, Vancouverites tip less often than those in Ottawa, Montreal and Toronto. Yet earlier this year, when a B.C. restaurant became Canada’s first “no tipping” establishment, customers complained and the policy was bagged. Clearly, giving cash is still in fash, but there are other ways to thank with panache. Even if you don’t give gratuities throughout the year, the holidays are a special time to show your service providers some appreciation. Just like the man in red, make a list of people you’d like to treat this holiday season. As you reflect on 2014, think about who makes your life easier year-round. Consider people who went the extra mile, or those you’ve done business with for a long time. Since tipping is based largely on relationships, there are no right or wrong answers. However, if you are not sure whom to tip and how much, as a rule of thumb you may refer to a helpful little guide known as the Gratui-Tree. Guardians & Angels: Those who take care of family members (babysitter, caregiver, petsitter) take priority. If you can only afford to tip a few people this year, choose from this category. Domestic Help: Next on the list are those who take care of the home (housekeeper, gardener). However you can, pay it forward. A show of appreciation now can assure exceptional service in the year ahead. Services: The third category comprises those who provide services to you on a regular basis (hairdresser, personal trainer, concierge). The equivalent of 1 visit/session or double your usual tip, whichever is higher. The bigger the city, the more services residents are likely to use. For Vancouverites, the list of people to tip can get very long. If the thought of all those gratuities gives you a nightmare before Christmas, consider just a handwritten note, or a homemade gift. Don’t break any laws when being a Santa Claus. Generally speaking, those working in the public sector and in financial institutions are not allowed to accept currency, but gifts are OK. Want to tip your mail carrier? Canada Post has no official policy, while FedEx and UPS drivers are asked to politely decline cash gifts. In some cases, gift cards are considered currency. When in doubt, review policies beforehand to avoid an awkward refusal. As the old saying goes, “it’s the thought that counts.” Show some thought by including a nice handwritten note with your gift. Kind words are cherished by all and you can trust they won’t be re-gifted. Even if you’re in a cash pinch, there’s no excuse for being a Grinch. 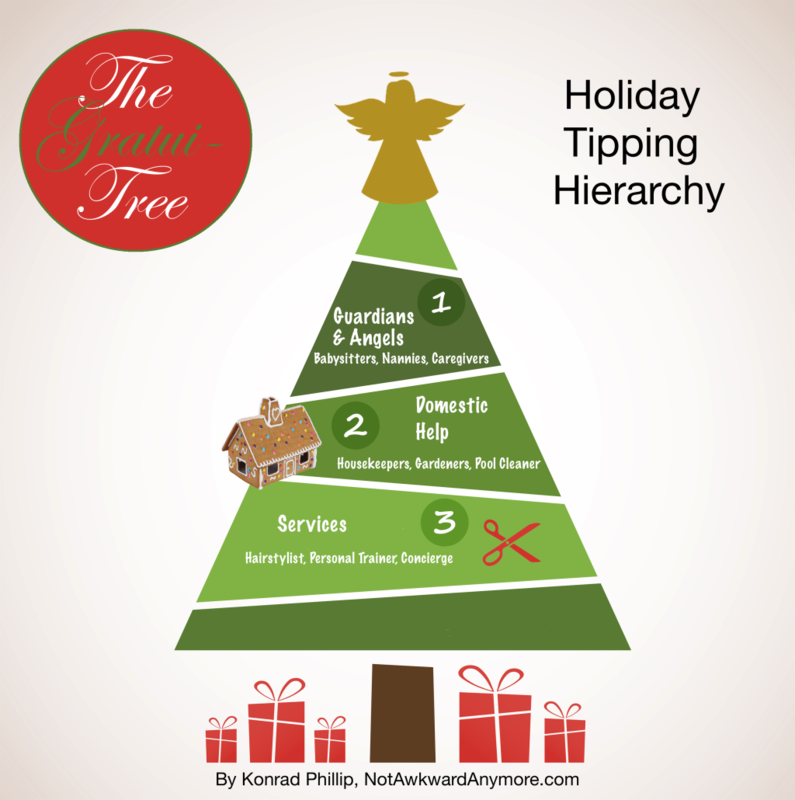 If you list and prioritize your tips, you can make everyone around you feel special this Christmas. Best of all, you’ll have enough money left over to afford their services in the new year.